Day 2 of the AdVintage 2016 wine tour saw us in Imotski, a small town east from Split, only a couple of kilometers from the border with Bosnia & Herzegovina. 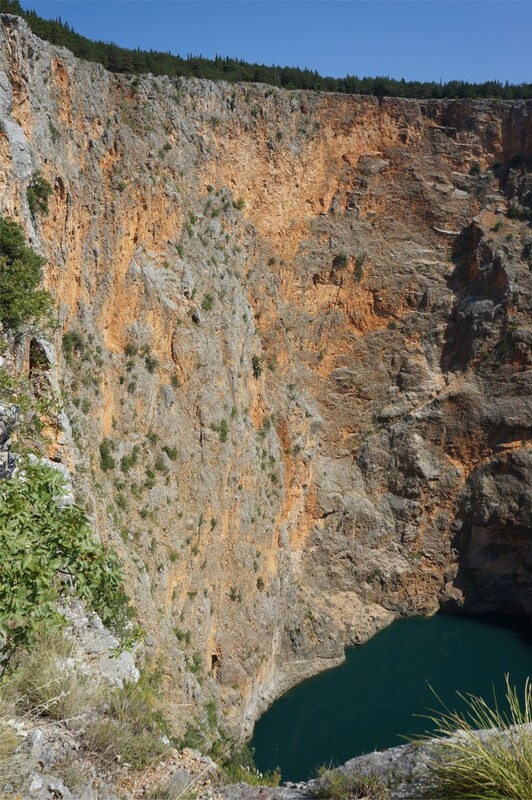 As a tourist destination it is famous for its Blue and Red Lakes (Modro & Crveno jezero) which we briefly stopped to look at…. 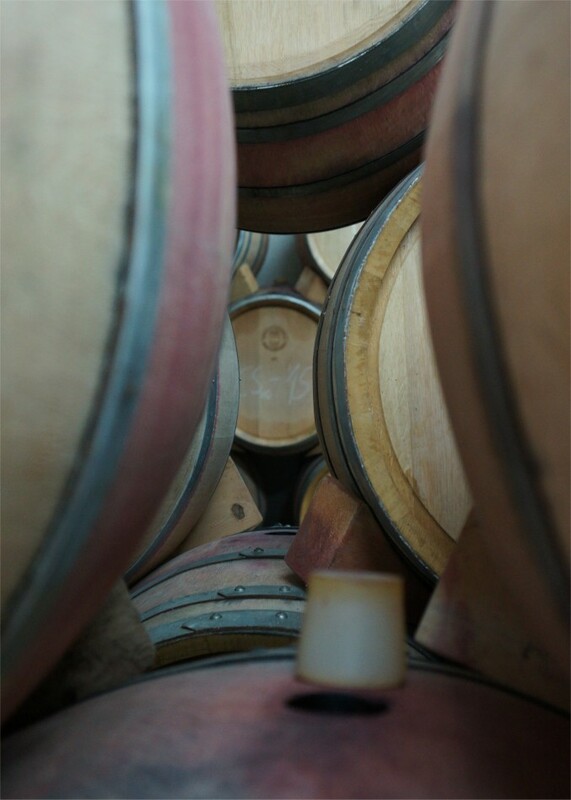 …but we were here for the wine, and 2 wineries were lined up for the day. Imostski is part of the Dalmatian Interior (Dalmatinska Zagora) wine region, sandwiched between the Adriatic and the Dinaric Alps. The town and some of its vineyards are on slopes, with an expansive and very flat valley floor below where more vineyards grow. It’s local varieties include Kujunđuša, Zlatarica, Medna and Maraština but the region is also planted with more recognisable international varieties which we were to taste. The area gets a high diurnal temperature variation in the growing season, 15C at night to 32C during the day. 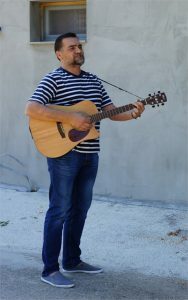 First was Podrumi Šimunović, where the group was welcomed with shots of flavoured Grappa and a guitar-wielding singer who turned out to be the life-long friend of the owner and winemaker. The wines were presented by the lovely Ela who told that the winery has been running approximately 50 years and now produces 30,000 bottles a year using a mix of Croatian and international varieties, all blends. 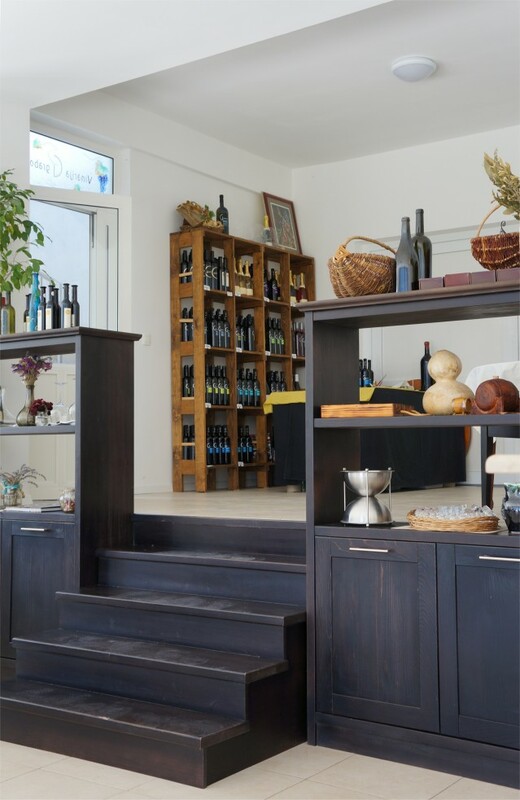 They have been running tourist tastings for the last 2 years and we were in their new tasting room, providing cool relief from the intense heat outside (>30C). 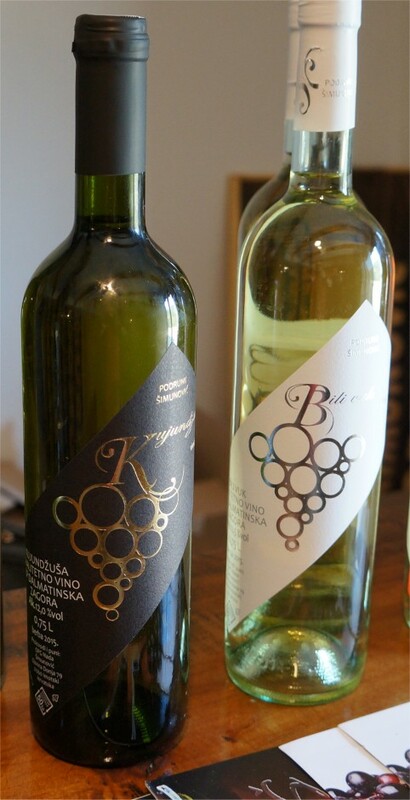 The first wine tried was the 2015 Kujundžuša White, 12%. Kujundžuša is a high-yielding variety that used to make up 80% of all plantings in the Imotski valley. This example gave a creamy, herbal nose and was clean and fresh on the palate with good weight and delicate floral flavours. A creamy yet mineral wine with a dry finish, very pleasant. Next up was the 2015 “Bili Vuk”, a Chardonnay & Žilavka blend at 12.5%. Žilavka is a grape planted primarily in the Mostar region of southern Bosnia and Herzegovina. There was pronounced tropical/Passion fruit on the nose, maybe a touch of mango. Ripe fruit on the approach moved into bracing acidity for the mid-palate, and a touch of bitterness on the dry finish. It was a full, ripe wine with a light sweetness – balanced and pleasant. Then there was the very international Merlot, Syrah, Cabernet Sauvignon Rosé at 12.5%. It had a light nose of strawberry jam with a lean, almost bitter palate and a spicy finish. The fruit came across as a touch unripe and more of a drink to have with food than on its own. Finally to the red, with the 2014 “Crni Simon” also at 12.5% alcohol. This was a blend of Vranac and Trnjak with a little Merlot and Cabernet Sauvignon. 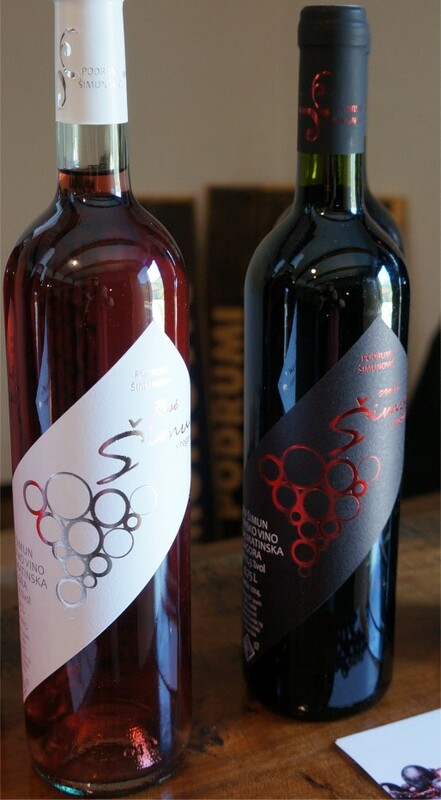 Trnjak is another Imotski/Bosnian grape, thick skinned and late-ripening, while Vranac (Vranec) is closely related to Crljenak (Zinfandel), native to Montenegro and Macedonia but widespread across the Balkans. The wine had spent 6-12 months in oak and showed some leather and violets on the nose with a touch of sweet liquorice. It had a smooth, fruity approach going into a very dry finish, but was a bit too lean and green; tart acidity behind the tannins but little primary fruit, suggesting the grapes may have been picked too early. In summary, the nose was to die for, but the taste disappointed. We then re-boarded the coach and made the short hop along the valley to the Grabovac winery where we had lunch to accompany the tasting. 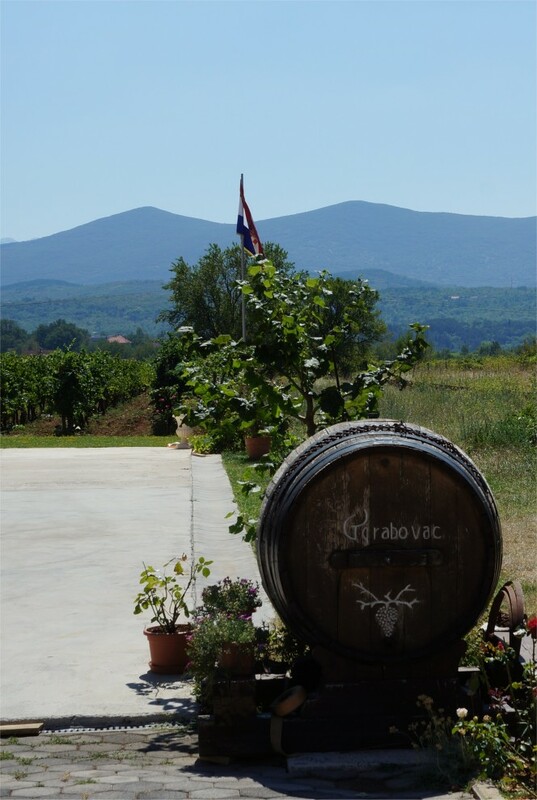 The modern commercial winery was established in 1994, but Grabovac family winemaking dates back to approx 1812. 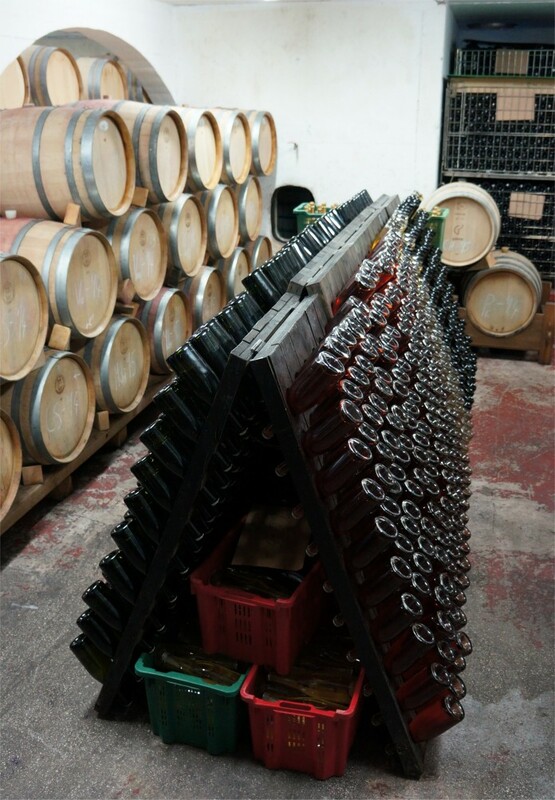 It was the first Dalmatian winery to produce a traditonal method sparkling wine and the first to plant Pinot Gris. 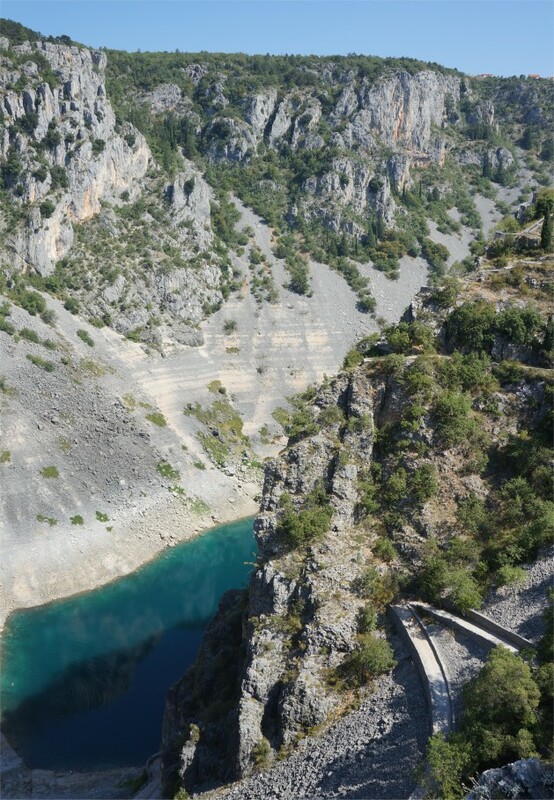 They have 15 hectares (ha) of vinetards, 8ha on the stony slopes up to 450m and 7ha on the more fertile valley floor. These are planted to local varieties including Kujundžuša, Pošip, Žilavka, Trnjak and Vranac, and international varieties such as Chardonnay, Sauvignon Blanc, Merlot and Cabernet Sauvingon, with Pinot Gris used only in sparkling production. There is no vineyard irrigation (by choice) and Milan compared the valley soils to Bordeaux’s Pomerol, especially good for Merlot. As well as a delicious lunch we had a quick cellar visit down a spiral staircase into a tank and barrel room plus dozens of sparkling bottles ready for disgorgement. 90% of their barrels are from Slavonia (northern Croatia) the rest American. 1/3 new oak in total across the range. Pošip Žilavka 2015 white. Pošip is an aromatic variety known for its refreshing acidity and citrus aspects, it is also one of the the main grapes used for drying to make the local prošek dessert wine (which we tried elsewhere…delicious!!). The wine was a 50/50 blend at 12% and had a grassy nose, slightly reductive with a touch of mint. The approach was light with a citrus tang then dry from the mid-palate, but just a little too thin and simple to really excite. Then to the 2015 Sauvignon Blanc at 12.5%. This was a blend of valley and hillside fruit where a New Zealand influence could be tasted. It had Sauvignon typicity; grassy, herbal, ripe and pungent. Also a light approach but with very strong citrus sharp acidity on the palate, tart and lemony. Nice if you like Sauvignon leaning towards New Zealand in style. The 2014 Chardonnay “Sur Lie” was something different, a bigger wine at 13.5%, made from hillside grapes, barrel fermented and aged 12 months on the lees in 50% new oak. It was ripe with tropical fruit on the nose (dried banana) and some caramel/fudge. On the palate there was tingling citric acidity with a firm structure and caramel on the long finish. This was a superb wine, the oak is a touch prominent at the moment so could handle 1-2 years further bottle age. The first red was the 2014 Trjnak, 13%, 15-16 months barrel aged in 1/3 new oak. There’s only 200ha of this grape in Croatia or Bosnia and before today I’d never heard of it, yet here I was on my second example in as many hours! It had a youthful colour and showed dark berries with sour cherry on the nose, with some smoke and tar. There was a spicy approach, sharp acidity with some smoky oak on the mid-palate and a warm finish. Another good wine where 2-3 years seems about right. 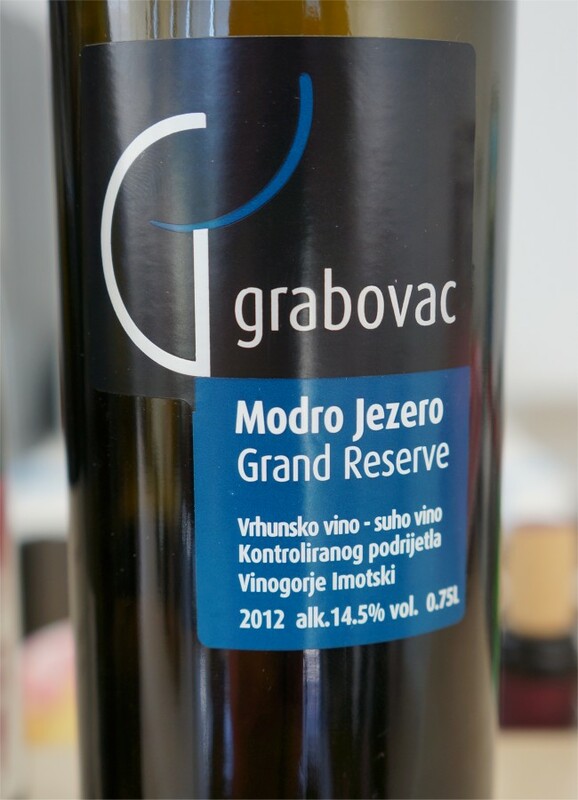 The last red was the Modro Jezero (blue lake) 2012 Grand Reserve: Trjnak, Vranac, Merlot & Cabernet Sauvignon, 14.5%, aged for 24-30 months in barrel. It was very dark in colour with a volatile aroma of dark berries and a touch of vanilla & smoke. Spicy acidity on the approach, settling into a strong structured mid-palate and a long, oaky finish. This was very good indeed, also with a few years life ahead of it. We finished with sparkling; first the Rosé (Trnjak, Vranac, Merlot and Cabernet Sauvignon) which had a dark berry aspect with a tonic water/quinine aspect that was rather refreshing; then – for those who made a beeline for Milan at the tasting counter – their White sparkler made from Pinot Gris, Chardonnay and Sauvignon Blanc. This had a yeasty nose and a dry, citrus and green apple taste, also delicious! 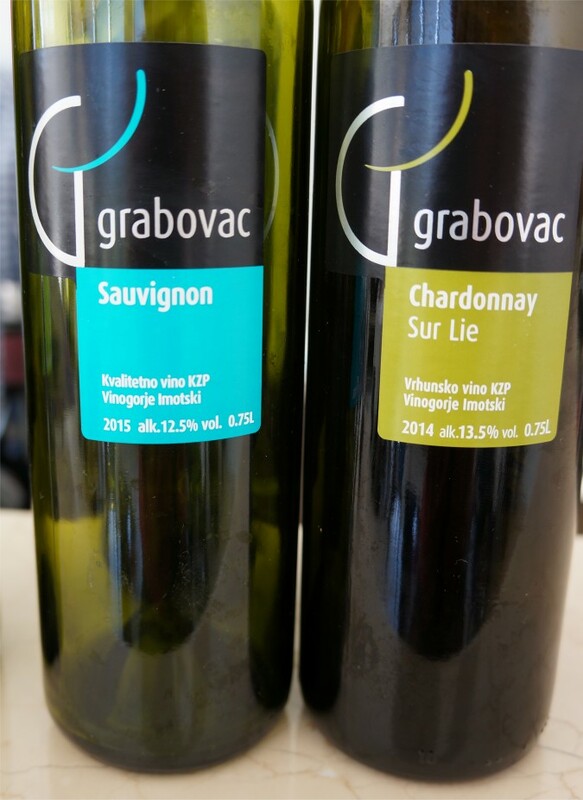 Imotski is definitely a region to be aware of when looking at Croatian wines and Grabovac was the star of the day, helped along by Milan’s infectious enthusiasm. It probably was the star of the week, equal with Putalj on the first day’s trip for the quality of the wines and the similar personalities of Anton vs Milan, but edging ahead due to the lovely lunch, a couple of extra wines on tasting and being able to see the barrel room as well! This entry was posted in In Vino Veritas, Wine Producers, Wine Regions and tagged AdVintage, Croatia. Bookmark the permalink.